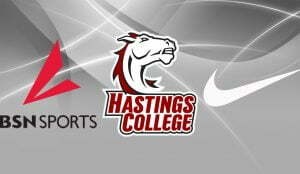 Hastings College athletics has entered into a multi-year partnership agreement with BSN Sports, which offers athletic apparel and equipment through Nike. The agreement offers Hastings College athletic teams and club sports access to Nike branded team apparel, uniforms, footwear, equipment, accessories and other select products offered by BSN Sports. Nike is the world’s leading designer and marketer of authentic footwear, apparel, equipment and accessories for sports and fitness activities. BSN Sports, a division of Varsity Brands, markets and distributes products to thousands of teams across the country, from middle schools to colleges and universities. Hastings College fields 22 athletic teams, with the Broncos participating in the Great Plains Athletic Conference (GPAC) and the National Association of Intercollegiate Athletics (NAIA). Hastings College Broncos teams are consistently some of the best in the GPAC and NAIA, in terms of both competitiveness and academics — with multiple national and conference championships and more than 500 scholar athletes in the last decade. BSN Sports is the leading marketer, manufacturer and distributor of sporting goods apparel and equipment. A division of Varsity Brands, BSN Sports markets and distributes its products to more than 100,000 institutional and team sports customers in colleges and universities, middle and high schools and recreational programs throughout the United States via catalog, e-commerce and direct sales. Focused on providing game-changing solutions through local partnerships, multi-brand selection and one-stop shopping for equipment and uniforms, BSN Sports’ more than 2,000 employees have been helping elevate participation in team sports since 1972. For more information about BSN Sports visit www.bsnsports.com.